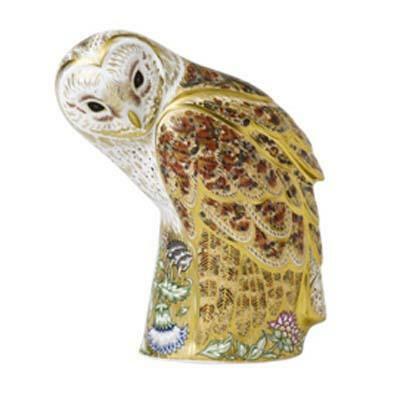 In celebration of this magnificent bird, Royal Crown Derby has chosen the Barn Owl as the subject of the next prestige paperweight range. The prolific pairing of Donald Brindley and Tien ManhDinh have once again captured the beauty of nature, and the production team have tested their skills to manufacture a paperweight measuring 23.5cm high for this limited edition of just 300 pieces. Donald's model shows the owl sitting patiently waiting for its next meal to make a sound or movement that will alert it to its presence. Tien has studied the wing patterns and facial expressions and recreated the complex feathers and their beautiful colours of buff, peach, grey and gold.